For a while, our site has been focusing on sake and has not lived up to our “Tokyofoodcast” name or our dorky phrase “Et-chan and Te-chan eat Tokyo” you find under the title. For the last 8 months, I have been thinking about blogging about food here in Japan, especially fish and regional food I love. 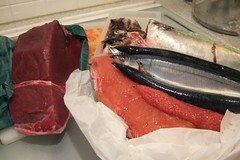 To re-start the food side of our blog, I am going to pick my favorite topic and place on earth, Tsukiji. My first trip to the fish market was so intimidating–not knowing when and how to cross streets when all kinds of moving objects were coming at me from all directions–cars, motorcycles, little one man operated carts people call “Taare“, or people, what to buy and how to buy fish, and how to talk with wholesalers. Somehow, Te-chan and I managed to ask a very nice guy who worked at the market where to eat and he was nice enough to take us to a sushi place he recommended. Oh, to show I was a typical tourist then, other than eating sushi, I got there at 6:30 am. The second trip was still scary. I had the same problems minus the nice guy. Even today, after a handful of trips to Tsukiji, I am still awed by the idea of going there–not because of going through chaotic narrow alleys and seeing fish jumping out of the water. I am more concerned if I am “disturbing” them–not the fish–the people who work there. When visiting Muir Woods, we saw a sign that said, “Do not disturb the bark.” So, if bark can be disturbed then people at Tsukiji might really get disturbed [see rules for talking to fishmongers]. Or, are they less sensitive than redwood bark? With high hopes of learning what to do (or what not to do is more appropriate, I guess), I took a class offered by the guy I call my Tsukiji sensei: He’s a tuna wholesaler by day TST (Tsukiji Standard Time day starts pretty early) and fish writer/spokesperson by night, JST. Did he tell the class quick do’s and don’ts? No, not really. Instead, he just talked about how to enjoy fish that’s in season and a bunch of funny stories about people working at the market. Somehow, though, I got his message: Tsukiji is a workplace for all wholesalers including him, for retailers, or for people shopping for restaurants. So, these are sort of the rules of Tsukiji I gathered from him. Rule #1 – People do not have right of way, fish does. Stay out of the way from anyone delivering fish and stay away from crazy little round vehicles laden with fish. They will choose to save fish rather than people. Rule #2 – Do not go to the market at the peak business hours. “Wakaishu=youngsters” for guys, “One-san=sister” for women at all ages. Last shopping trip to Tsukiji, one Saturday in late July around 10:30 a.m. was so different from any other trips I had–full of good surprises for a special reason. Wholesaler, Ken-san, cut up fresh katsuo for us to taste as breakfast and Maru-chan cleaned saba for me to take home. I do not think anyone expected to buy fish at Tsukiji and have their fish cleaned–it just never happens–let alone having freshly sliced katsuko for breakfast. This was a one-time thing my sensei organized on his blog to have the general fishy population like us over to his shop and nearby shops–an extra “shopper-friendly” day. After one hour of shopping frenzy adrenalin rush and all the excitement from eating fish, everyone went home with big boxes of seafood that day, feeling so good. I realized by going there later rather than earlier, people were more relaxed, oh, with the exception of those crazy little “taare“. 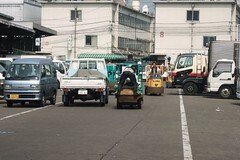 No rules of the road at Tsukiji. Oh, my God! This sounds so fun! Great post, Etsuko. But can you tell me next time you plan on having a crazy Tsukiji adventure? I was there with one of my visitors last week, and it scared the hell out of me. Tsurete ne!! Hi Melinda, It is totally chaotic, isn’t it. So, next time wa isshoni iko!